Baby I'm a Wild Horse, don't try to tame me. Born of midnight and ebony, K'yarie is a picture of beauty and elegance. Carrying the finest points of a Friesian draft, she is tall and powerful. Her silken mane falling to her knees in waves and curls. Her obsidian tail falling in curls down to her ankles barely brushing the ground. 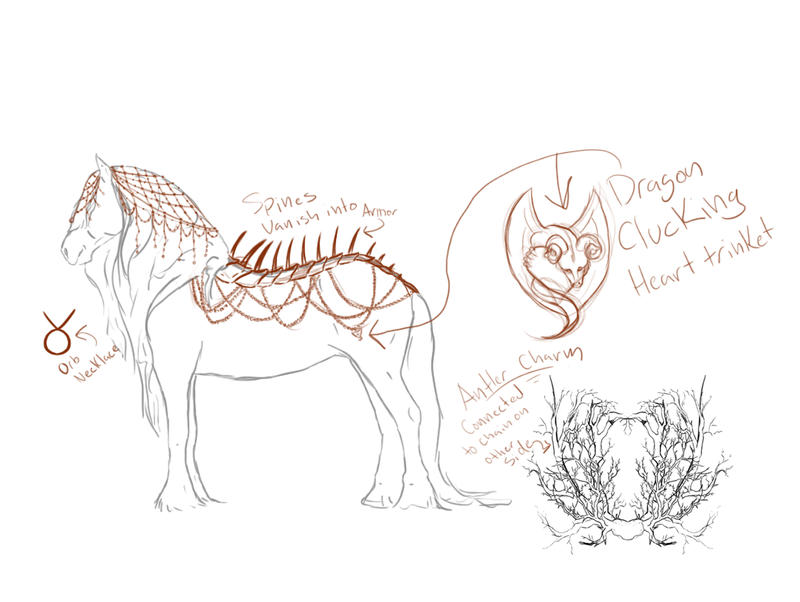 Feathering around her hooves provide a glossy cover to her circles her dark hooves. She carries herself with poise and grace. An ethereal beauty her gate is light like that of an angel walking on the clouds. The only thing breaking up the blackness of her being is the stark white marking on her face that comes down around her nose, which remains black as ink, wrapping down around her chin. The white comes up and tucks under her eyes. An embodiment of mystery, she moves in a calculated manner. At night, her true mystery and beauty unfolds as the moonlight kisses her skin. Her fur transforms into a living universe. 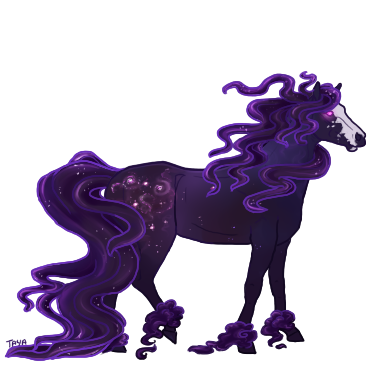 Rumors tell that the stars, enchanted by this mare's beauty, descended from the heavens to kiss her skin. Blessing her with their presence when the night fell. Galaxies swirl along her defined muscles, stars glittering within its depths. Occasionally a single, shooting star streaks across her body. 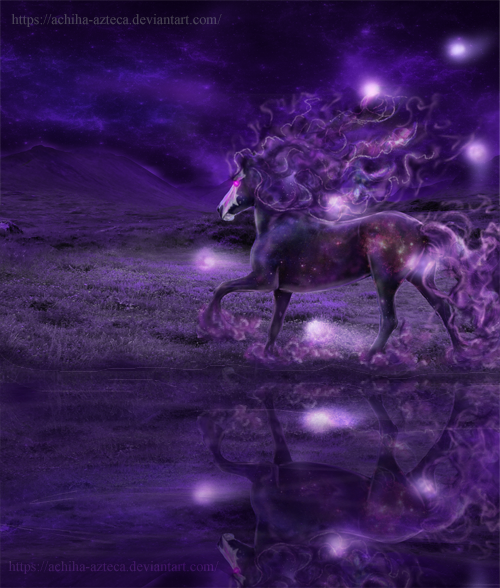 Her mane, tail, and feathering dissolves into flowing galaxies of stars and neon gasses. While her purple eyes take on a ghostly glow. This night sky fades into a ghostly scene that dances upon her body during the day. A wisp of an illusion that catches the eyes and imagination. At the touch of daylight her mane, tail, and feathering reverts back to its normal, flawless self. Floating around her at nearly all times, are gaseous orbs, like floating stars that drift and swirl around her. Their colors alternate from soft purples, blues, green, and so on as they float along. Adding to her mystery and otherworldly beauty. Smart. Witty. Cunning. Adaptable. Wise. Hardy. Warrior. Elegent. Poised. Calculating. Flirtatious. Hard to read and can change unexpectedly. K'yarie is every bit as mysterious on the inside as she is on the outside. She is calm, calculated. Her tones are soft and sweet as she speaks in careful tones. She is extremely cunning and smart. One can never truly tell what she is thinking or feeling, leaving everyone on their toes when she is near. She is confident in herself, walking with a proud and elegant gate, her head held high. This is the first that strikes you gaze upon K'yarie, he confident, swaying gate. She knows who she is, how beautiful she has become, and she is not afraid to show it. Her gate, her posture, the very way she stands exudes a woman who is comfortable in her own skin and confident in her own abilities. She has an eloquent tongue that would cause any man to follow her should she so choose. When times call for it she can become brash her tone a purr as she so easily picks away at every weakness, or brings light to a very obvious point that no one seems to understand. She is extremely flirtatious, whether this is because she truly finds you attractive, or simply wants something from you, is never quite certain. However, she will never give herself to someone. Her heart will not be won by just any stallion. And when she does choose to give it away she expects them to be ever faithful, as she will be. Or else. She is extremely self reliant and adaptable. Capable of thinking on her feet. She is ever poised, ever graceful. Her emotions are in check, ever in control. Her gaze absorbs every detail, for knowledge is power. Born with a strong will and a strong spirit, K'yarie is not easily broken, or damaged. However, she is only mortal with a heart to be broken. She guards this heart fiercely and does not easily let another in. Like a rose her thorns are sharp, unbending. But like the crimson petals K'yarie possess a soft, delicate side that she is unafraid to share with the right people. This softness is often a stark contrast to her cold and mysterious air most everyone sees. But this girl can be just as tender and understanding as she is spirited. She is undying loyal to those who gain her trust and will do everything within her power to help those she has deemed friend. However, those who betray her will feel her wrath. She will not kill them, no. She will merely destroy their entire world. Everything will slip from their grasp as all they have carefully crafted comes crumbling down. No, she will not kill you, but let you lay in the ashes of all that she has destroyed. When with those she feels that she can trust, her gentler side emerges. She is tender, kind, and spontaneous. A playful side emerges. She is very witty. And she is very wise. Forged from the fires of The Rift, she is a hardened sword that will defend those she cares for (Or deems useful). A warrior trained by her father, she is not afraid to throw her weight around if cornered. When angered she can become a whirlwind. A demon from your worst nightmare. Extremely perceptive, she has learned to study others. Able to read and pick up on the subtle signs and idiosyncrasies given off by others. She has to be in order to locate the weaknesses of her enemies quickly. She is also extremely cunning, and is unafraid to use her wiles to get what she wants. She will manipulate and trick others whenever she deems necessary, all those she does not call friend or family are fare game. She has learned that in order to survive one must be adaptable and flexible. She has had to learn to live and adapt to many different environments and situations that the rift has thrown at her. Because of this she is not easily perturbed by things, and will not freak out when things do not go her way, not right off the bat anyways. She is an extremely fast learner her willpower pushing her to learn more should her astute abilities fail her. As a result she can adapt to survive many environments and conditions. She sees the big picture and knows what she needs to do to get there. Though it was more prevalent when she was younger, K'yarie does posses a rather impish side to her that can cause trouble. Though this side of her is reserved for the most trusted. Though K'yarie does hold her emotions in check, she can crack. When her temper flairs she does not become a useless wreck. Oh no. Her blade is sharpened to its deadliest point. She is harder, colder, more calculating and focused. Nothing will stand in her way and she is unafraid to draw blood in order to settle things. In this state she is far more physical, more willing to use strength and force to get what she wants. Whether furious or as poised still water, there is one thing that is certain; K'yarie is not afraid to get her hands dirty in order to get a job done. K'yarie's life was rather simple in her youth. Even when her father brought home a strange mare and a filly not much younger than her, life was easy. She learned that this other girl was her sister and soon came to love her as dearly as if she were her twin. From her father she learned how to be a warrior, to fight and defeat enemies. He was a hard man, and never pulled his punches. He wanted sons, not daughters and demanded from them what he would have demanded from a son. Her mother taught her grace and poise. She was tender and cunning. Elegance, manipulation. Both gave her the wits needed to survive out in the cruel world. Yes, her life was simple and despite her father's hard heart, she was happy. Her spirit was far lighter, more kind then it had been before everything happened. She was only two when she fell in love. The stallion was handsome and charming. She fell head over heels for him. But Cersi was never one to be outdone by her sister. She tempted the stallion away, stealing his heart and ultimately breaking her sister's. When K'yarie discovered the betrayal she confronted her lover. They argued. She was young and emotional, far younger then the one who had stolen her heart. 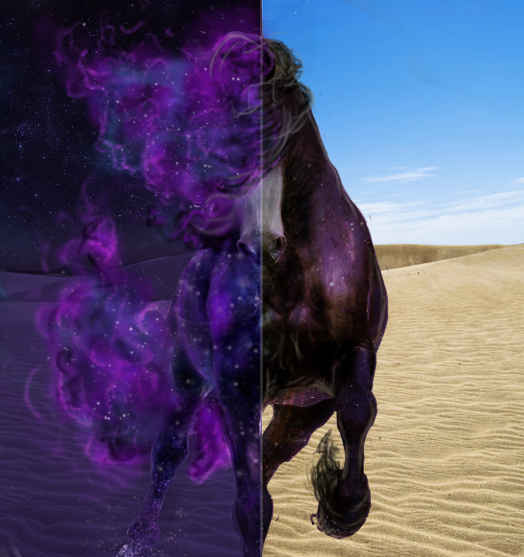 When the stallion's anger grew he attacked her. Instinct kicked in and all the hours of training with her father survived her well, it may have very well saved her life. But she was inexperienced and was unable to gain the upper hand. She had to escape or surely she would die. This was when she came into her magic. Fleeing into the shadows she emerged, beaten and exhausted before the entrance of their home. This was where Cersi found her. She learned of what had transpired and sought revenge for her sister. Though she had lost, K'yarie had managed to deal some serious damage to the stallion before fleeing. In a weakened state he was easy prey for the enraged sister. To this day K'yarie does not know of the murder her sister has committed. Fore when Cersie had returned she claimed that she ran the stallion out of their lands. The two eventually made up, but there is still a small, but very apparent rift that lays between the two sisters due to the young's betrayal. Even so, K'yarie will do anything for Cers. For she is the only family that she has left. Because of the betrayal, K'yarie does not trust easily. Nor will she ever let her heart be taken by another. She guards it like a dragon protects it hoard. She is far more manipulating, cold, and calculating. Her father's lessons were taken to heart and she hides her tender side with utmost care. After being betrayed by her own sister, K'yarie ventured off on her own. She has survived within The Rift for six years. She has yet to make up an opinion on these strange intruders from Helovia. On the one ha,d she feels bad for them and the destruction of their world. On the other she sees then as an opportunity to revive her own realm. Able to travel within shadows. Can melt into her own shadow and enter this dark world. She can travel up to a mile in distance, though she can only make 4 leaps at such a distance before her magic is exhausted. Smaller leaps are easier and she can do more depending in the distance. Leaping only half a mile ups the jump count to 8. A few feet is miniscule and she can make around 20 of these leaps before her fuel runs out. Glowing orbs, like gaseous stars that change their subtle hues, float around her. Lighting her way at night. They glow brighter when danger is near. It is said that those who have a connection to the realm of spirits can hear faint whispers, in an ancient tongue, coming from the orbs. Only K'yarie can understand what they speak. When not in use they disappear into the starry sky that is her body. The largest and oldest of these floating stars posses names and appearent personalities. Rory is more self serving and delights in violence. It is more inclined to try and manipulate K'yarie into causing chaos. Cue is far more concerned with preserving K'yarie's life. Is is suspicious of others and will quickly alert her to danger. Cyphe is, well, we haven't quite figured out Cyphe. This ball tends to be more random and can reflect different thoughts abd personalities. These are the three distinct orbs that tend to share their opinion more than the others. Either way all of the orbs have one thing in common. They want to keep their host alive. K'yarie will use these orbs to gather information and cab send then out within a 2 mile radius. Tiny black thorny garland/antler charm awarded in » Reign of Kaos & Hopebringers rewards! Able to travel within shadows. Can only be killed by someone who truly loves her. Able the absorb the oxygen around her until only she, and anyone she deems worthy, can breath within her 'atmosphere'. A crown of silver chains and purple purls. Prevents the wearer from being controlled or swayed by magic and enchantments. Necklace with a small bright orb set in it; the orb can light up to ward off darkness or unpleasant things. Spine of Hope: Bronze and gold armor covering the spine; spikes tipped with venom can be raised along it. The venom causes a burning, and later, numbing sensation. Glowing, star-like orbs float around her. They speak in a language only K'yarie can understand. Glowing palm-sized Piece of Hope marking. Fashion something from the Pinus ambulo's flesh. Steal a male Pavo Cat's tail plume. Carve your name in the Ultima cave wall. Help another steal something valuable. Destroy some of Akvo city's coral. Collect the Solar Flower petals-without being burned.